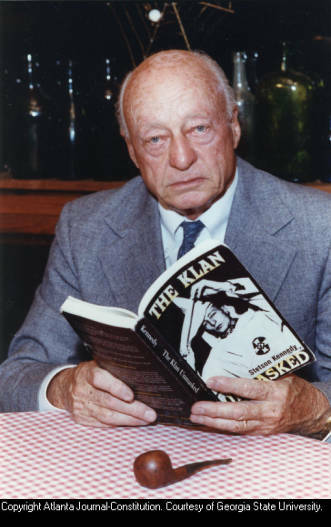 Author Stetson Kennedy with his book The Klan Unmasked, 1990. In this evening of celebration, Stetson’s close friends and several scholars who have curated his legacy provide insights into Kennedy’s life as an accomplished activist and socially conscious journalist. The evening’s events include a roundtable discussion, followed by a reception and a special screening of rough cuts from the soon-to-be-released documentary on Mr. Kennedy, Klandestine Man, produced by Spark Media. Please join us for an evening of knowledge sharing and conversation about the impact not only of Mr. Kennedy’s life, but also the continuing work that is being done by a number of people to curate and present his legacy to the public. The Southern Labor Archives is home to the Stetson Kennedy Papers, available through GSU Library’s Digital Collections. This event is sponsored by the Kenneth England Fund for Southern Studies Programming, GSU English Department. This entry was posted in Digital Collections, For Faculty, For Graduate Students, For Students, General News, Special Collections & Archives, Uncategorized. Bookmark the permalink.